MANY RIBS in 7 in. 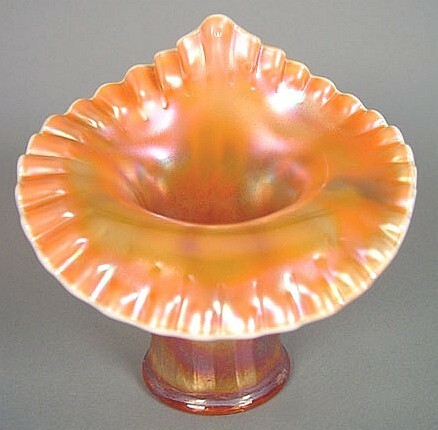 JIP CRE Peach Opal. Left - MANY RIBS - 5 inches tall - Peach Opal. Right - MANY RIBS (20 ribs), 6 inch Vase in amethyst. 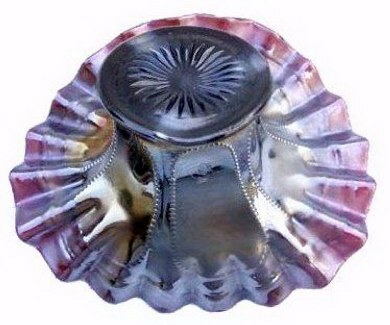 MANY RIBS: A pattern found in hat shape, JIP vase and vases of 5”-7” in either ruffled or tightly crimped style. 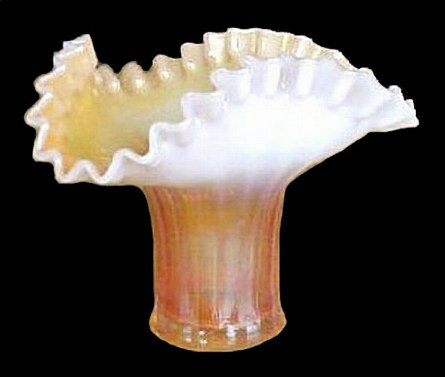 Carl Burns’ book on Dugan Glass illustrates an unusual color combination in the ruffled type vase; peach opalescent on frosted, camphor glass. 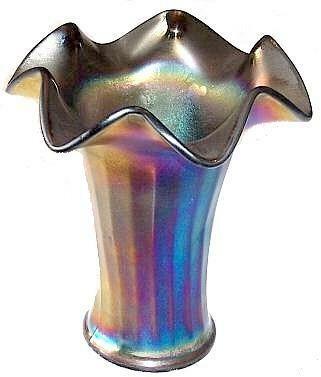 Other colors: amethyst, oxblood, marigold, white and peach opalescent, with cobalt blue confirmed in a JIP vase. No white JIP or hat shapes have been confirmed. 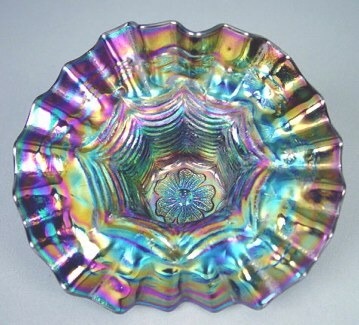 Despite the fact that production continued by Diamond following 1913, this pattern is not a “regular” found in carnival glass auctions. 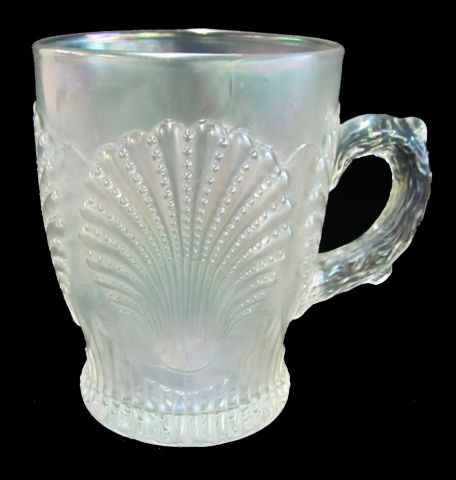 RARE White BEADED SHELL Mug. 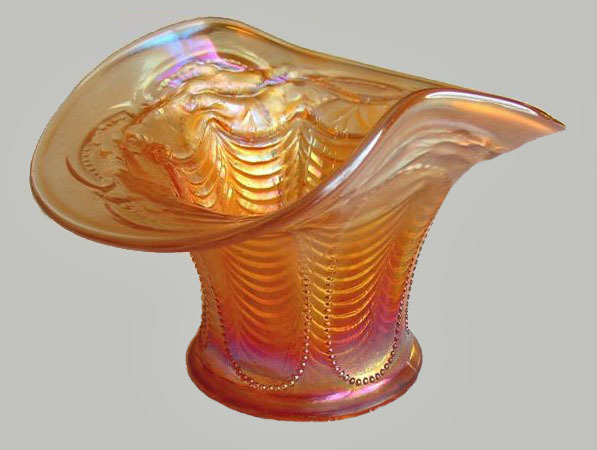 BEADED SHELL: First introduced in non-iridized glass in 1903, original factory catalogs named the pattern New York. 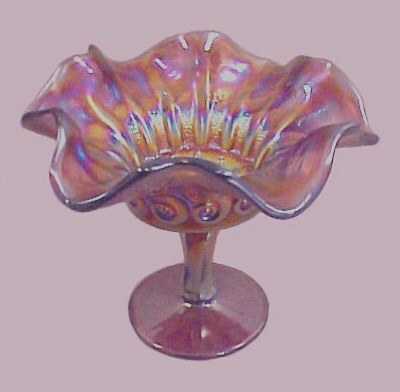 It probably was among early carnival glass production, perhaps in 1910 and continued to appear in wholesale catalogs through 1916. 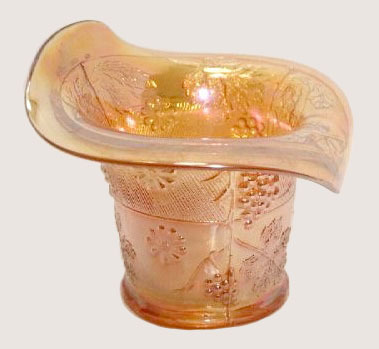 Marigold and amethyst berry sets and table sets are known. The water pitcher is known in marigold, amethyst and cobalt blue. Those same colors are found in tumblers, with lavender examples, as well! 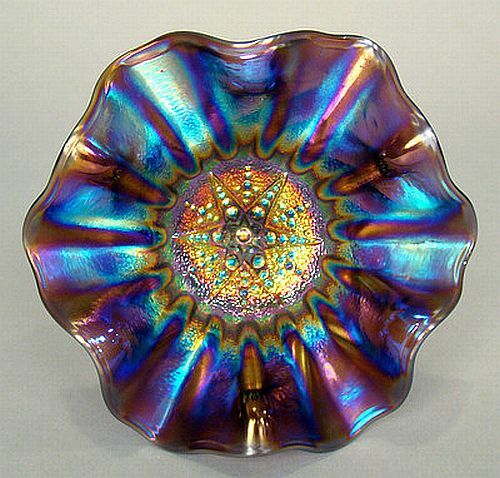 (The mug is found occasionally in white, along with marigold, amethyst, cobalt blue, lavender as more “standard colors”). A single white mug in whimsy shape; flared and ruffled has been confirmed. CONSTELLATION Compote in Scarce Lavender - 5 inches tall. CONSTELLATION Compote: The exterior pattern on this small and rather delicate 5” compote is actually the S-Repeat design, but to give it distinction perhaps, collectors prefer to call it Sea Foam! There is a known compote having a frosty white bowl section and a marigold stem! Your guess is as good as anyone’s as to how/why this exists? Usual colors are: marigold, amethyst, white, peach opalescent, and lavender. FLORAL & GRAPE JIP Hat from Tumbler. FLORAL & GRAPE Hat: Reported in amethyst and marigold, the ruffled hat shapes and the marigold JIP shapes were formed from the tumbler mold. They are scarce. Tumblers are known in marigold, amethyst, cobalt blue and white. Water pitchers are known in the same colors and a few in lime green w/ marigold overlay. DAISY WEB Hat - 3.5 inches tall. Left - DAISY WEB Hat -Purple.Spectacular! $1100. 2-08 in Tampa. Courtesy Remmen Auctions. Right - The interesting exterior pattern on the DAISY WEB hats is called BEADED ARCHES. DAISY WEB : JIP hat shape is known in amethyst / purple. 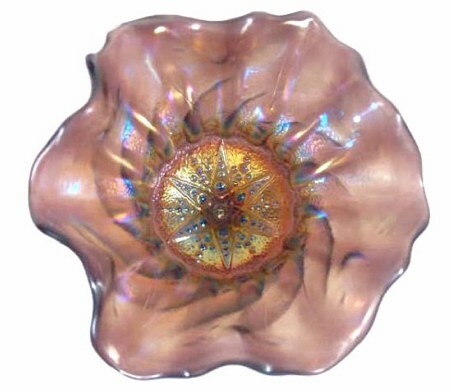 Ruffled or crimped hats have been found in marigold, amethyst / purple, and peach opalescent. This pattern has never been plentiful and the interesting beaded design on the exterior is called Beaded Arches. Larry Keig named the pattern in an article written for the ICGA Pump newsletter. Collectors now have another “fitting” name to add to their memory bank! 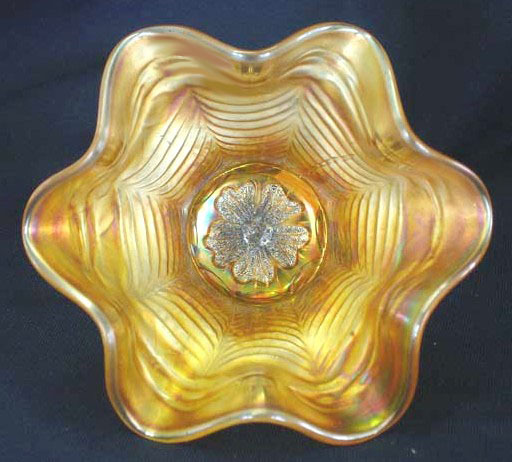 Baskets having clear glass handles are infrequently seen in marigold and amethyst / purple. To mock is to act impiously toward holy things. Almost identical language as that contained in Jude is found in 2 Peter 3. Likewise, these scoffers do not obey the law of the Spirit, but follow fleshly passion.